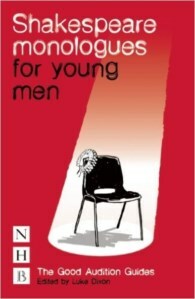 Here you will find a rich and varied selection of monologues for men from plays which were produced and/or published in the 2012-2013 theatrical season. Most are for young performers (teens through 30s) but there are some excellent pieces for older men as well. All represent the best in contemporary playwriting.